Klein's battery-operated cable cutter is engineered to make linemen's work more efficient by reducing the time and effort needed on the job. Cuts up to 500 MCM copper, 500 MCM aluminum and 556 ACSR cable. 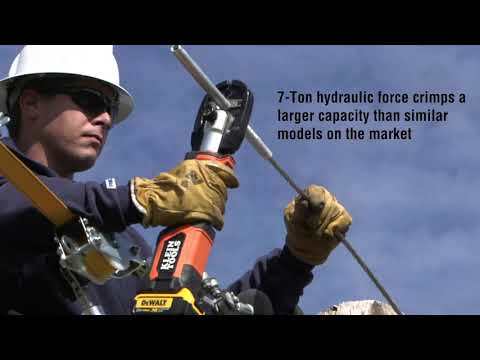 7-ton hydraulic force crimps a larger capacity faster than similar models on the market. Compatible with industry standard W-style dies. Powered by DeWALT 20V lithium-ion batteries. Includes cutting jaw, two 2 Ah batteries, charger and bag.